If you blog under your own name, you’ve already been able to associate your blog with your personal Google+ profile. Starting today, you can now connect your blog to a Google+ page for your brand, business or organization. Each time you post on your blog, we'll show you a Google+ share box to let you notify followers that you have new blog content. If they like what you share, followers can +1 or reshare your post to their own friends on Google+. This ripple effect exposes links to your content to a wider audience. Adding the Google+ gadget to your blog makes it easy for people to add your profile or page to their circles when they like something you’ve published. Forming connections with readers that last after they've left your blog is essential. To get started, click the “Google+” tab in the Blogger dashboard and then the “Upgrade” button. If you’ve already upgraded to Google+, we’ll help you associate your blog with your profile or page. We'll be introducing more settings on this tab in the future, so stay tuned for additional ways to get more out of Blogger with Google+. If you have questions, you can learn more in our Help Center. This entry was posted in Blogger Buzz and tagged +1, Blogger, Blogspot on July 31, 2012 by Emily Wood. Tickets for this year’s Splendour In The Grass festival sold out in record time, but that doesn’t mean you have to miss out on the fun. Thanks to Virgin Mobile, a full eight hours of music will be coming to you live as Splendour returns to Byron Bay — and returns to YouTube for the second year in a row. So for the festival goer in you that just can’t get enough, put on your gumboots, get our your festival gear and enjoy some live tunes from the comfort of your own home. We kick off at the Supertop stage with Gold Coast’s Bleeding Knees Club at 3:00pm, followed by The Cast of Cheers and Last Dinosaurs at 4:30pm. And the beauty of watching on YouTube means no crowds to fight with! Pop over to the Mix Up stage and catch Friends at 5:25pm before cruising back to the Supertop for a little action from across the two ponds — British Sensations Band of Skulls, back to back Kiwi female vocalists Ladyhawke and Kimbra, and Swedish Sensation Miike Snow closing out the night at 9:50pm. We’ll also be featuring interviews and highlights from a number of other acts, will be streaming all the live acts to mobile, and will be putting out video highlights in the days following the close of the festival so you can relive the action wherever and whenever you fancy. See you out there. Stay dry and enjoy the show! This entry was posted in YouTube Blog – Australia and tagged YouTube on July 25, 2012 by wdavidmarx. Earlier this year we introduced a suite of new SEO features that help ensure your blog, posts, and images are accurately indexed so they appear correctly in search results. Today we’re happy to introduce another feature that enables you to more effectively customize your search preferences - custom permalinks. When you write a post, Blogger automatically generates a permalink based on the title of the post. Until now, blog authors have had no control of the permalink. 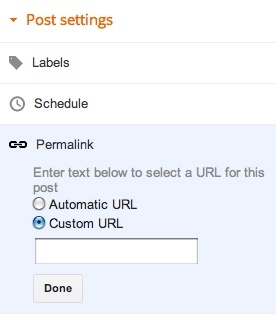 Custom permalinks give you more control of your blog and posts. These new custom links also provide readers with more information about your post when scanning search results. If you prefer to use a custom permalink, you can do so via the “Permalink” option in the Post Settings box. The bolded area is the portion of the URL that is customizable. If the custom permalink you entered already exists, Blogger will attempt find a free one for you. At present, the characters allowed in a custom URL are limited to: a-z, A-Z, 0-1. The only special characters available are underscore, dash, and period. Click here to read more about custom permalinks in the Blogger Help Center. This entry was posted in Blogger Buzz and tagged Blogger, Blogspot, SEO on July 18, 2012 by Emily Wood. Ever since we added legal search to Google Scholar, researchers have asked us to make it easy to find the most recent court opinions for their queries so that they can make sure they're up to date. Today, we're adding an option to sort legal search results by date, the most recent appearing first. To see the latest results for your query, click on "Sort by date" in the sidebar. You can also use the new sort option in combination with court and time restrictions as well as searching within citing documents. For example, opinions in California courts mentioning "terry stop", opinions mentioning "terry stop" in 2007-2008, and opinions and articles citing Terry v. Ohio. This entry was posted in Google Scholar Blog and tagged Google Scholar on July 11, 2012 by Anurag.